Dementia can be very socially isolating both for the person with dementia and those who care for them. Isolation and loneliness are incredibly common in older people and are both much harder to cope with when those people are also living with dementia. Many people find it more difficult to access community venues and events, and to either continue with previous interests or find new ones, especially when the general assumptions about what people with dementia are able to do can be so negative. There‘s increasing work on finding ways to support carers of people with dementia in ensuring they live as well as they can with the condition. This includes considering what the cultural arts could offer, particularly as they gain evidence more generally in holistic healthcare. Exeter’s Royal Albert Memorial Museum (RAMM) has been dementia-friendly since 2013. 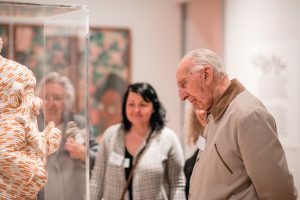 RAMM offers monthly dementia-friendly activities including object-handling, art-making, and exhibition tours, as well as quarterly special events including music in the museum. Volunteering on RAMM’s programme has given me valuable insights into how these programmes (and museums in general) function, and hugely influenced my thinking and the work I’m doing now. Museums are places that are accessible (and often free!) beyond just the time a group or activity is actually happening. This means dementia-friendly activities in places like museums may be particularly valuable in opening up spaces in the community for people with dementia, as well as simply being interesting and stimulating. Over the past year, I’ve been working closely with RAMM in Exeter. As part of my PhD research examining museum programmes for people with dementia, I’m creating a theory examining the impact of including carers in dementia programmes on the person with dementia, the carer, and the relationship between them. Although this will be within a museum-specific context, the theory should be applicable more generally across many aspects of dementia care and wider. Despite the fact that most interventions and programmes (including those in a museum context) do involve carers, there’s very little research examining the impact of this. If we can understand this impact, we can enable museums programmes to run more effectively through understanding who they work for (and, just as importantly, who they don’t work for), and what works for whom. It will also indicate how to best support people on the programme, as well as providing general evidence for their effectiveness. The kind of museum programme I’m interested in is focused on the present moment, rather than on reminiscence. It’s about enjoying the activity, being intellectually stimulated, expressing yourself, and socialising in a group. It’s also about the shared experience of the person with dementia and their caregiver – enjoying the activity on an equal basis. For example, recently, a daughter and mother came to an object-handling session at RAMM. The mother has dementia and is legally blind, and her daughter was struggling to find activities which were both accessible and related to her mother’s interests. After tea and coffee, they held objects together and talked about the different textures and shapes they could feel. The daughter described some of what the objects looked like, but they focused on the shared tactile experience of the objects. It was a lovely example of the ‘in the moment’ shared and accessible activities the museum aims to offer. These programmes are facilitated in a way that isn’t reliant on memory, but rather on the thoughts and ideas of the attendees in the moment. This enables people with and without dementia to participate on an equal basis. The activities are designed and adapted for people with dementia, but they’re not about dementia – the emphasis is always on enjoying the museum and the activity together. One man with dementia who participated had difficulties with aphasia (a language impairment). But in a tour session he was able to contribute a really interesting insight into some artwork, specifically because the facilitation style allows people the space and time they need. It’s also set up to be ‘failure-free’ – there are no wrong answers when the question is what do you think about this? Information about the artwork or objects are woven in (and people always ask for information about what they’re seeing or holding), but it’s not a lecture, it’s more a part of the discussion. It’s this supportive and uplifting facilitation style which is key in opening up the museum and allowing equal participation. One carer who came with his wife said it’s something that’s for him as well as for her, in part because it’s not “dumbed down.” It’s still the same museum, just facilitated differently. More details and booking can be found here! This work forms part of a PhD funded by the Dr & Mrs Alfred Darlington Charitable Trust. This entry was posted in Uncategorized on 10th Apr, 2019 by jh790. IDEAL is a research project based at the University of Exeter, an Alzheimer’s Society Centre of Excellence. The centres are our biggest single investments into research to improve dementia care. DEAL (Improving the experience of dementia and enhancing active life) aims to understand what affects the ability of people to live well with dementia. This week Alzheimer’s Society and the University of Exeter brought together people with dementia, researchers, medical professionals, policy makers and service managers. The event shared the latest findings from the IDEAL project around living well with dementia and shaped the next steps of the research. Professor Linda Clare, leading the IDEAL programme, explained what living well with dementia meant to people with the condition. The top answers included several things that many of us might take for granted – getting out and about, being fit and active and seeing friends. This post also appears on www.alzheimers.org.uk. This entry was posted in Uncategorized on 17th Dec, 2018 by jh790. Four years on, the ALWAYs group reflect on their contributions to dementia research at Exeter. We are a group of people with dementia and carers that we christened the Action on Living Well: Asking You (ALWAYs) group. Since 2014 we in ALWAYS have acted as an advisory support group to the Improving the Experience of Dementia and Enhancing Active Life (IDEAL) research programme, and it has been a joy. We have brought our lived expertise about dementia to help shape project materials, given feedback on the way the research has been carried out, given our views on the way the data has been interpreted and given presentations about our role with the IDEAL team. Recently, we got together to reflect on these past four years. We remembered some of the work we have done and thought quite deeply about how we feel about our role with ALWAYs. Has it been worth it? Has it made a difference to the IDEAL research? We concluded “yes”! It was great to think about this experience together. We wrote an article and made a film to share our ideas about how researchers can make PPI (patient and public involvement) a thread that runs throughout their research. Our article is full of really practical ideas about how to achieve this – and our film shows how it feels in practice to become part of the ALWAYs team – a team that fills us with confidence, is full of respect and trust, and that provides a safety net of support to find our (sometimes quiet) voices. So what our lessons for practice? Build trust, communication and rapport between people who are involved and the research team. Small and informal helps here. Listen and give people feedback and say what has changed because of their input. Provide regular updates including study progress. Our article “Reflections on PPI from the ‘Action on Living Well: Asking You (ALWAYs) advisory network of people with dementia and carers as part of the IDEAL study” can be read here. You can watch our film “Meet the ALWAYs group” here. We created a masterclass on ‘Involving People with Dementia and Carers in Research’ and you can watch it here. The Improving the Experience of Dementia and Enhancing Active Life (IDEAL) study funded by the Economic and Social Research Council (UK) and the National Institute for Health Research (UK) through grant ES/L001853/2. The support of the ESRC and NIHR is gratefully acknowledged. This entry was posted in Uncategorized on 29th Oct, 2018 by jh790. An accumulation of small lifestyle factors can make a big difference in quality of life for people with dementia. On World Alzheimer’s Day, Dr Anthony Martyr, from the University of Exeter, summarises the evidence on how you can best support friends or loved ones. It is estimated that more than 850,000 people in the UK have dementia, a number set to increase to 2 million by 2051. This year alone, 225,000 people will develop dementia – that’s one every three minutes. It’s therefore critical that our research efforts don’t focus exclusively on finding a cure. Even if it could be identified now, any treatment would only be likely to benefit people currently in mid life. Dementia is now the most feared condition in the UK, but it is possible to optimise quality of life and support people to live as well as possible. Many people don’t know how to react when they hear an acquaintance or loved one has dementia. I hope my research helps give people confidence to try ways to support those with dementia, as well as informing policy. As part of the University of Exeter-led IDEAL study, a large-scale approach to identifying which factors can support people to live as well as possible with dementia, I recently led a review of all the available evidence in the field. It involved the four year task of analysing 198 studies worldwide, encompassing information on nearly 38,000 people with dementia. Amid this mound of data, one of the key factors that emerged as making a real difference was how socially active people were. Too often older people can be socially isolated, and we know this contributes to dementia risk. Maintaining social activity and being included and involved in social activities were both lined to better quality of life. Family, friends and neighbours can all contribute here, and many organisations run excellent initiatives such as memory cafes and day centres to meet this need. 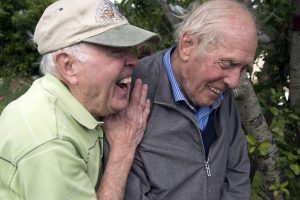 One arm of the IDEAL study is the A Life More Ordinary project where, photographer Ian Beesley, cartoonist Tony Husband and poet Ian McMillan worked with people with dementia who were involved in Age UK Exeter’s Budding Friends allotment group. The group itself is an outstanding example of social interaction with real purpose, and the artists’ project saw them produce works that will be on display outside Mothercare in Exeter’s Guildhall Shopping Centre today. People with dementia also valued being able to manage everyday activities. The GREAT Trial, which along with the IDEAL study is led by Professor Linda Clare at the University of Exeter, recently found that an approach called cognitive rehabilitation therapy can help people with early stage dementia significantly improve their ability to engage in important everyday activities and tasks. It involves working together to establish personalised everyday goals, which could range from cooking food without burning it to successfully going to the shops or remembering neighbours’ names. Therapists worked with family carers and people with dementia to establish ways to meet the goals that suited people’s individual needs and abilities. Good relationships with friends and family was another key element to higher quality of life. Interestingly, certain factors that can be seen as “life goals” had no bearing on differences in people’s quality of life – particularly education level, marital status and income. We also identified factors that were linked to poorer quality of life. People with dementia who had poor mental or physical health, who had unmet needs, who experienced pain, or whose carer experienced low well-being were more likely to have poor quality of life. We also found that quality of care and support was important. For instance, where a person with dementia is supported by a family member, quality of life is better where the family member feels more positive and better able to cope. 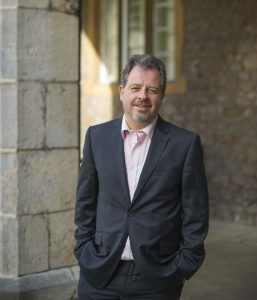 Professor Clive Ballard, at the University of Exeter, has led studies concluding that people with dementia in residential care, receiving specialist person-centred care, which involves the individual in their own care plan, is linked to better quality of life, when combined with just ten minutes a day of social interaction. The average amount of social interaction in care homes is as low as two minutes a day, so even a brief daily visit could increase a resident’s quality of life. Unsurprisingly, our findings did not identify a “silver bullet” for supporting people to optimise their quality of life. As individual as we all are throughout our lives, so are our preferences on how we want to live in older age. However, our research did identify that a number of factors can combine in small ways to make a real difference to the extent to which people enjoy their lives. I hope this encourages people that making their own small difference can contribute to a real overall benefit. This could be through engaging someone in conversation or an activity they enjoy like a jigsaw, perusing a photo album or some gentle gardening. The key factor is taking the time and care to ensure that it is individualised to what the person enjoys in life. To find out more about dementia research at Exeter, visit http://www.exeter.ac.uk/dementia/ or follow #ExeterDementia on Twitter. This entry was posted in Uncategorized on 21st Sep, 2018 by Louisa Yu Sum Lee. Dr Byron Creese chose to pursue a career in dementia research after studying Psychology at University. His work focuses on the often under-recognised neuropsychiatric symptoms, such as hallucinations, which can cause huge distress in Alzheimer’s disease and other dementias. Around two thirds of people with Alzheimer’s disease experience these kinds of symptoms. Byron’s work focuses on neuropsychiatric symptoms as risk factors for dementia, and aims to identify links between the disease and our genes. Can you give us an overview of the work you do? When people think of Alzheimer’s disease or other dementias, most think of symptoms to do with memory, thinking, planning and reasoning. However, a significant number of people with dementia also experience symptoms like hallucinations, suspicious thoughts, agitation and depression. Examples of these would be thinking that their food has been poisoned, or that their relatives aren’t who they say they are, seeing people, animals or objects, or being very tearful or agitated. We refer to these as neuropsychiatric symptoms, and they can be hugely distressing and have a major impact on a person’s quality of life. A major challenge of these symptoms is that we don’t have many effective treatments. This is a particular problem in treating psychosis, where there isn’t much evidence for non-pharmacological (non-drug) interventions, and the drug treatments we have are only slightly effective. These drug treatments also cause numerous severe side effects, such as Parkinsonism (shaking and unsteadiness). They also increase the risk of falls, triple the risk of stroke, and double the risk of death. To develop new treatments, we need to understand more about the biology of these symptoms, and how they present clinically. To do this we have gathered a very large database of Alzheimer’s disease cases which have accompanying genetic data. How did you get into dementia research? I studied Psychology to Masters level until 2006. After university, I took a break from Science and worked in Finance for a few years. During that time, my Nan developed Alzheimer’s disease, which I suppose brought a career in science and research back to my attention. In 2009, I began a PhD with Professor Clive Ballard, which was focused on psychosis in Alzheimer’s disease. A lot of the work we did at that time involved building up a big cohort of DNA samples from people with Alzheimer’s disease who had experienced symptoms like psychosis, depression and agitation, as well as those who did not experience any of these symptoms. The kind of genetic research we do requires a large sample size – many thousands of samples really – so no single group can do this on their own and we are still busy setting up new collaborations to get more data. Could you explain your Genetics research in more detail? The first thing to highlight is that this is a highly collaborative project. We have data from many thousands of people with Alzheimer’s disease from largely from the UK and Norway but also from Italy, USA, Greece, Poland, Finland, France…I think that’s all! We take DNA samples from people with Alzheimer’s disease who have particular symptoms we’re interested in – these neuropsychiatric symptoms. We look across the person’s genome – the genetic blueprint for who we are – for variation. Variation across the genome is what gives rise to differences like hair or eye colour. We already know that certain variations are associated with an increased risk of disease and we want to know if there are any which are associated with neuropsychiatric symptoms. This could give us a clue as to why some people develop these symptoms and some don’t. If there are any, we can work out if they’re nearby a gene. If that gene is of interest, we can do more work to investigate that, which could give us new research avenues. We also use genes to look at shared genetic risk factors between disorders and conditions across the lifespan. For example, in younger adults, you can have a condition like schizophrenia which is associated with psychosis, and then we see psychosis in older adults, and in dementia. One question we’re trying to answer is: is there any biological similarity between those symptoms? Are these symptoms caused by common mechanisms? What we discover about connections between Alzheimer’s disease and other conditions will also raise the possibility of developing new treatment options for people with Alzheimer’s disease and psychosis. Are there any other projects you’re excited to be working on? I’m currently involved in the PROTECT study – there we have a group of 25,000 cognitively healthy adults aged 50 and over. They’re assessed for these types of symptoms – depression, hallucinations, and we’re also conducting work to evaluate the significance of those symptoms in the development of later cognitive problems. The types of questions we’re asking are hallucinations in a cognitively healthy population associated with any sorts of memory impairments? And will that be useful in helping us predict who’s going to develop dementia? We can then integrate that info with genetics as well, to see if that can enhance the predictive value of genetics. This can helps us to predict more accurately who will develop symptoms, and at what point we can intervene. Examples of interventions could be social interventions, personalised care, or keeping people healthy for longer. How do you feel dementia research is progressing? There’s an increasing focus on neuropsychiatric symptoms in dementia. Soon we should have some new consensus criteria for psychosis in Alzheimer’s disease which will help establish a commonly accepted definition of what psychotic symptoms in the disease look like. Prof Ballard and I will be working on this as part of a group led by colleagues in Canada and the USA. We’re seeing new treatments in the drug development pipeline, but I think there is an urgent need to develop treatments targeting novel disease mechanisms. What that means it that most drugs in development at the moment are ones that target biology of the disease that we already know about. There are also a number of drugs in development for agitation and psychosis in AD which have shown efficacy in schizophrenia which brings those trans-diagnostic links I mentioned earlier into focus. Non-drug treatments are also emerging, so things like exercise and social interaction. That’s definitely a good thing, as the side effects of commonly used anti-psychotics are quite severe. Hopefully we’re getting to a position now where we can start to answer some questions about diseases mechanisms. Collaboration really is the key here and luckily we’ve found a lot of researchers willing to team up on this. Next year we’ll have been gathering DNA samples from people with Alzheimer’s disease for 10 years – the collection we have now is one of the largest in the world. We’re on target hopefully in the next couple of years to get up to 10,000 samples which should allow us to take some big steps forward in this field. It’s quite unusual to have such a high number of samples with high quality clinical data, so we’re very lucky in that respect. Follow Byron on Twitter @byron_creese to keep up to date. To read more about dementia research at Exeter, please visit our website, or follow #ExeterDementia. This entry was posted in Uncategorized on 3rd Sep, 2018 by Louisa Yu Sum Lee. Artificial Intelligence (AI) – human intelligence exhibited by machines – in healthcare is developing rapidly, with many applications currently in use or in development in the UK and worldwide. 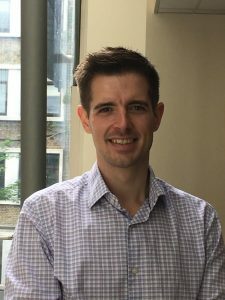 We speak to Dr David Llewellyn, a Senior Research Fellow in Clinical Epidemiology at the University of Exeter Medical School, about the impact of AI on dementia diagnosis. 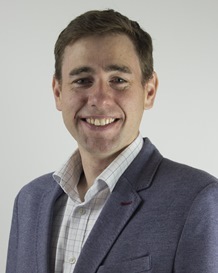 David’s research focuses on how data science and AI can improve the way in which we conceptualise neurocognitive disorders in order to improve diagnosis, treatment and prevention. How do you define AI as it relates to healthcare and what are some of the biggest transformations that it will bring to the field? In its broadest sense, artificial intelligence is the creation of generalisable intelligence. At the moment the majority of progress is being made with machine learning, where we’re teaching machines to learn patterns in real clinical data. We’re taking techniques that have been developed for a wide range of purposes, for example, self-driving cars and search engines, and applying this to real clinical data. This gives us a massive advantage in that we’re able to handle a much richer range of data than we were able to do so before with traditional statistical methods. We’re developing pieces of software which can be used by clinicians or patients to improve healthcare efficiency, patient safety, and patient outcomes. How close are we to a world where AI are used to diagnose and treat patients? I think that AI is already used to diagnose and treat patients but in limited ways. For example, before patients come and see their GP, they’re increasingly using the internet. They’re using AI through search engines to work out what their symptoms might mean. Doctors are also increasingly using various forms of AI and we’re seeing the growth in decision-making aid. It’s very much that the doctor is still in control, but they’re getting more targeted information about individual patients. Do you foresee a future where AI technologies can operate autonomously in healthcare? We’re much further away from systems that can actually make decisions autonomously without the doctor and without any clinical oversight. If we think about autonomous cars as an analogy, we’ve got cruise control. Similarly with AI in healthcare, we’ve got aids to decision-making. What we don’t have are ‘robot doctors’ that can diagnose and treat patients without any human oversight. I think that will come, but we’re a long way from that. The biggest question at the moment is how we are going to regulate that process. If it’s an aid for doctors but the doctor is still in control, then you can regulate it as a medical device. But if it’s autonomous, then actually what it’s doing is practicing medicine, not supporting a doctor who practices medicine. Medical societies regulate people who practice medicine but who exactly is going to regulate machines that have the capacity to practice medicine? I don’t think we’re anywhere near to reaching a solution for that and there is certainly no way which we can effectively regulate that at the moment. Are there any common misconceptions or general misunderstandings about AI that you believe could use some clarity? When we think about how AI can influence medicine, there’s often the misconception that it’s going to deskill the workforce and put people out of a job. However, when you bear in mind the immense pressures that the NHS is under, I think AI technologies in healthcare should be seen as a massive opportunity to improve patient outcomes and to make the jobs themselves better for clinicians. Particularly things that are routine – they can be taken away from a clinician’s job. It will become less about whether AI will replace clinicians, but more about how clinicians will use the technology to enhance their own abilities. That’s a tremendous opportunity if you can empower clinicians to think in that way. It will allow them to focus on the human side of medicine, which for most medical professionals is the most interesting bit! Identifying people with dementia is clinically challenging given the non-specific pattern of symptoms associated with it. You’ve recently developed a computerised decision support system called DECODE to help address this. Can you tell us more about it? It’s a very difficult clinical challenge assessing patients who you may not know well and who are concerned about their memory and thinking, and trying to work out whether they are just ageing normally as no two cases of dementia are exactly alike. If you’re a non-specialist, you may not have seen a patient with a particular combination of signs and symptoms before. So one of the advantages of DECODE, a machine learning-driven system, is that it can learn to recognise patterns in hundreds, thousands, potentially millions of dementia cases and work out what needs to happen clinically to benefit that patient. So it’s the idea it doesn’t get tired or distracted and it’s very consistent. It’s not a completely objective system though, as it captures the human expert decision-making that we used to train it in the first place. To find out more about the DECODE project, follow David (@DrDJLlewellyn) on Twitter. To read more about dementia research at Exeter, please visit our website, or follow #ExeterDementia. This entry was posted in Uncategorized on 20th Aug, 2018 by Louisa Yu Sum Lee. It’s an incredibly exciting time in dementia research. I’m part of a team from the University of Exeter who have just returned from the Alzheimer’s Association International Conference in Chicago– one of the largest showcases of worldwide dementia research. It’s where the cutting-edge of dementia research is shared, often for the first time. It’s really on the front line of discovery. We presented our own research in a range of areas around improving prevention, treatment and care in dementia, and we spoke to the research teams behind the latest innovations. I’m feeling inspired and optimistic about a number of promising developments. There’s an urgent need for more and better research in dementia, a disease which affects 40 million people worldwide. Our own research highlighted that there are only 29 clinical trials with the potential to modify Alzheimer’s disease that have passed the first phase of testing – compared to more than 1,000 in cancer, for example. We’ve seen a number of high-profile failures in dementia clinical trials, and we urgently need more and better-designed trials to make an impact. We finally got the positive news we’ve been craving at the conference. A compound called BAN2401 is showing real promise in treating Alzheimer’s disease. In a trial of 800 people, it reduced levels of amyloid – a protein linked to dementia – by more than 90 per cent. The trial was conducted in people who already had some amyloid build-up in the brain. Particularly excitingly, more than 80 per cent of them saw levels reduce to normal over the 18 month trial, and the rate of cognitive decline was reduced by 50 per cent. It’s early days yet, but these figures are stunning – the most promising results we’ve ever seen in a clinical trial at this stage. We need a larger trial, which will take at least three years, to see if the results are confirmed. If so it will be a really significant breakthrough. Our research revealed that people with dementia are being harmed by medication designed to ease their symptoms. An opioid-based painkiller called buprenorphine and a class of sleeping pill called Z-drugs both increase harms such as falls in people with dementia, and in turn falls lead to a significant rise in death rates. It makes sense – these drugs have a sedative effect. We have to stop sedating elderly, frail people with dementia and look for non-drug options to help them more effectively. Our research uncovered the harms caused by antipsychotics to people with dementia. It provided the evidence base to persuade everyone involved in dementia research and care to make a concerted effort to find alternatives, which led to a 50 per cent reduction in prescribing. We now need this approach with other medications – and to ensure that the alternatives we use are not harmful in themselves. Care homes are really challenging environments, both for people with dementia and for carers. Our previous research has shown that the average person with dementia experiences just two minutes of social interaction each day. Imagine that! It’s no wonder that levels of agitation and apathy are very high. Residents have complex needs and staff need training in techniques that really work. Incredibly, only three of 170 care home staff training programmes are evidence-based, and none of those improved quality of life. Our WHELD staff training programme incorporates ten minutes of social interaction each day and a programme of personalised care, designed around the needs and interests of the individual resident. It brings people with dementia and their carers together, resulting in improved wellbeing and more positive staff attitudes to care. We found these outcomes when the programme is delivered as e-learning, supported by Skype. It’s now time this rolls out to care homes to improve people’s lives. Our previous research has found that dementia risk could be reduced by a third, if people took action from mid-life onwards. Factors including diet, exercise, education, social interaction and effectively managing health issues such as hearing loss and depression all play a role in dementia risk. There’s an increasing body of evidence around links to blood pressure and dementia risk. Previously this has focussed around high blood pressure, but research at the conference has found compelling evidence that orthostatic hypotension – or unusually high drops in blood pressure – is also linked to increased dementia risk. We need to understand this better, but it does add further weight to the advice to look after your heart to protect your brain. The conference included interesting updates on the benefits of sleep – a deep night’s sleep means the amyloid levels in the body are lower the next morning. We also saw some interesting research on food products such as green tea, ginseng and omega 3 fatty acids, and on curcumin, contained in turmeric, and how they activate different parts of the brain that are implicated in dementia. We’ll be putting these to the test in our online PROMOTE platform, which has 25,000 people aged 50 or over signed up. Watch this space to find out what really works! This entry was posted in Uncategorized on 3rd Aug, 2018 by Isobel White. Hello and thank you for visiting our new Exeter dementia blog! We will be using this blog space to keep you in touch with all the latest dementia research happening at the University of Exeter Medical School. Over the next couple of months we’ll be inviting our dementia researchers to contribute to our blog – watch this space for an exciting insight into the work we do on dementia! This entry was posted in Uncategorized on 3rd Aug, 2018 by Louisa Yu Sum Lee.